Smart dog toys boil down to one critical component – the challenge! The more difficult the challenge, the longer your pup stays engaged. And if you’re the happy owner of a super active smart dog, your challenge (pun intended!) is to find the toys that will outsmart your pup and keep him engaged for hours. So if you accept the challenge, we have you covered in this short review. Today it’s all about finding the best toys for smart dogs. Here are the best 8 toys ranked in terms of challenge (top – most challenging, bottom – least challenging but still quite engaging). This fun toy will become your pup’s new favorite rainy day toy, guaranteed! Hide a squirrel is a puzzle toy your dog will love. Squeaky squirrels are hidden in the stuffed log and your pup has to work out how to “hunt them” out one by one through the small peg holes. Then do it all over again and again, and again. The toy comes in four sizes so there’s one for each dog type (small, puppy, large breed). Choose from Junior, Large, Jumbo or Ginormous! The first three sizes come with 3 squirrels while the Ginormous size comes with 6! 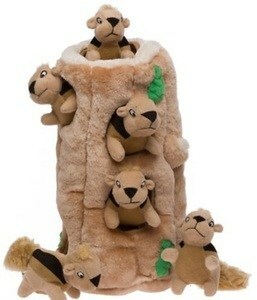 Oh, and if your furry friend likes to hide his toys, you can always buy replacement squirrels. Here's Zoey a Coonhound/Boxer mix playing with the Hide a Squirrel Toy. Highly recommended by pet parents, this puzzle toy is the best bang for your buck in what you get in terms of challenge and fun. Although be aware this is a toy you may have to replace every couple of months if your dog is an aggressive chewer. Big on training your dog? Need an activity game for your pet? This puzzle game toy is a fun brain teaser for your dog. This is an entry-level dog puzzle and the challenge is in finding the treats through some clever problem-solving. Tricky but smart! When your pup completes the challenge, you can raise the difficulty bar up by switching the board to different difficulty levels. Since this is an entry-level puzzle toy, Nina Ottosson’s puzzle toys also comes in difficulty levels 2 and 3. This is an extremely hardy but stimulating toy for dogs who like to rip their toys up. So, do you think your pup would be outsmarted Nina Ottosson's interactive smart dog toy? Only one way to find out. Treats or kibble are hidden inside this interactive toy so whenever your pup boops it, the treats come out. The Bob-a-Lot provides endless of entertainment and mental interaction. Can be customized to adjust for challenge levels and treat size. 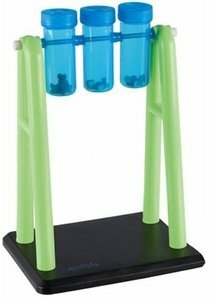 This dispenser toy will make your pup work hard for his treats and is self-entertaining for the hoomans too. The toy will teach your pet the value of patience and also love the challenge it presents. 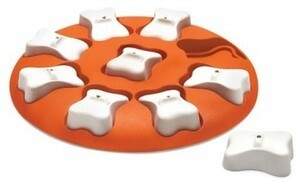 This is a great challenge treat dispenser and gets bucket loads of woofs from us! Ready to make your pup work for his food? The Trixie treat puzzle is a difficulty level 2 brain game which appeals to a dog’s natural inquisitiveness. Pet parents add regular food, kibble or treats in the test tubes. Your pet has to “experiment” and work out how to get the treats out of the already small holes in the test tubes by spinning them. Don’t worry, even though your pup will figure how to solve the puzzle, it’s quite hard to keep the tube upside down so he’ll have to keep trying. That and you could add treats that don’t easily fall out. Great for entertainment, problem solving, and interactive skills. Here's Trixie Mad Scientist food dispensing toy in action. Who wants to come over and give it a spin? 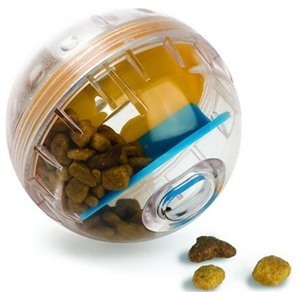 Still on the trend of treat-dispensing puzzle toys – the Pet Zone IQ Treat Ball is best for small to medium dogs and is available in two sizes: 3-inch and 4-inch. Parents can select the difficulty level. Simply drop a few treats or dry kibble into the top opening and let your pup get to work to retrieve them by nudging, rolling or chasing the ball. Made from hard, durable plastic it also dissembles for easy cleaning. 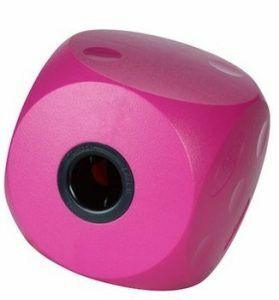 Find out if the IQ Treat ball dog toy will be able to outsmart your pup. Now here’s a smart toy for a smart dog. Drop treats into the top of the Kibble Drop where they fall into any of the 4 chambers. Then let your dog work it out by sniffing out which chamber the treat is and which flap to lift in order to retrieve it. It’s made with durable food-safe plastic and is BPA, PVC, & phthalate free. We give this smart toy a thumbs up! A toy that’s great for dogs that eat their meals too fast and for providing mental and physical stimulation. 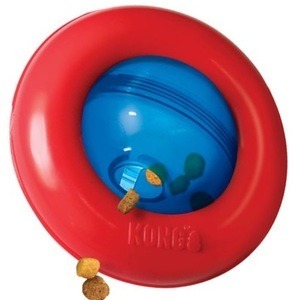 Fill the ball with kibble to slow them down at mealtime. Your pets meal has to work through the compartments before coming out the opening. So it won’t be that easy to get the treats outs! In addition, the lip inside the toy prevents the treats from spilling out. The Buster Food Cube comes in two sizes – Small for small dogs and Large suitable for large breed dogs. It is also available in two bright colors – blue or orange. Here's the Buster Cube in action, we think this toy will prove to be challenging for your smart dog! It’s also good to know it’s made from safe and durable thermoplastic rubber. 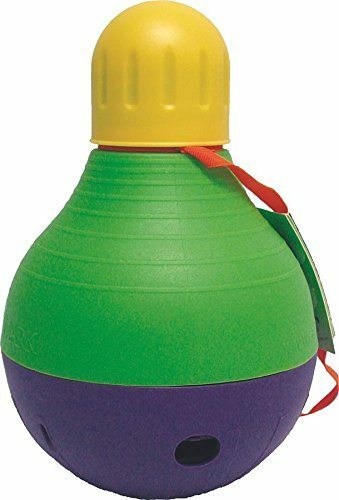 These are really great enrichment toys for your dog's mental stimulation and it is a fun way to utilize excess energy in a natural way which is something all our four legged friends need. It has the look of a mini planet in our solar system but the Kong Gyro Dog Toy isn’t just a fun smart dog toy. It is an interactive dog spy that isn’t as easy as the Wobbler and dispenses treats or kibble when rolled around. We’re sure the Kong Gyro will keep active dogs entertained with an irresistible roll and flip action that entices and intrigues dogs. 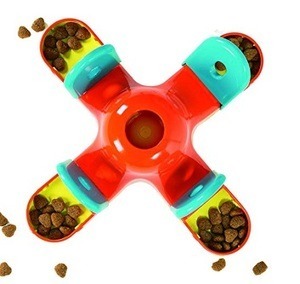 The dynamic centre spinning orb and static outer ring encourages pets to push, paw and roll the Gyro, delightfully dispensing tasty treat rewards along the way. Who’s ready to making dinner interactive? 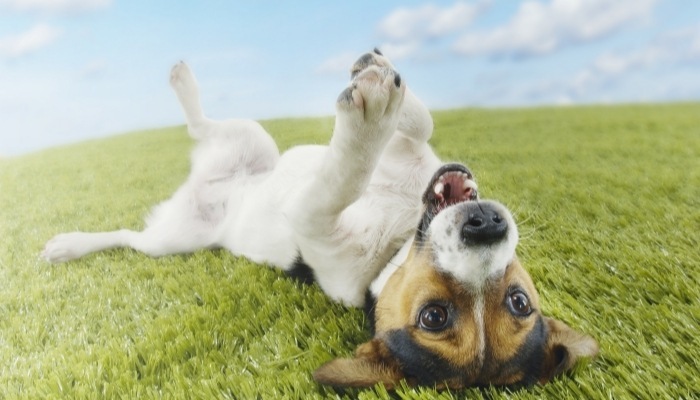 And that completes our review of the best smart interactive dog toys for super-active dogs. Introduce any of these toys into your pups’ meal and play times. Mental stimulation and enrichment games are so important with reactive, smart and bored dogs. These will surely keep them both busy and entertained.